One of the codes for feminism in India is to decry Ram, hero of the Ramayana, for abandoning his pregnant wife in the forest. Likewise, one of the codes for atheism, secularism and liberalism is to decry the same Ram for beheading Shambuka, the ‘low’ caste hermit for abandoning his caste duties. But, did you know that at one time you could prove that you are a ‘principled’ brahmin by rejecting Ram? In the epic, Ram kills Ravana, who is son of a brahmin named Vaishrava, of the Paulatsya clan, descending from Brahma himself. This makes Ravana a brahmin; and so killing Ravana was brahma-hatya, the brahmin-murder, a terrible crime, as bad as go-hatya, or killing of cows, in sacred code books known as dharma-shastras. Ram had to do penance to wash away the stigma of brahma-hatya-paap before he sat on the throne of Ayodhya. Many pilgrim spots in India, such as Rameshwaram in the south and Rishikesh in the North, are associated with the penance of Ram. This did not satisfy many brahmins of Ayodhya who chose to leave Ayodhya and live across the River Sarayu. These are the Sarayupaareen brahmins, or ‘the brahmins who chose to live on the other side of the Sarayu River’. An opposite version of this tale exists. Many brahmins in Ayodhya refused to perform the rituals that would cleanse Ram of brahma-hatya-paap. Those brahmins who did agree to do the cleansing ritual were excommunicated and it is they who became the Sarayupareen brahmins. We can never be sure which version is accurate, or older. Either way, this caste lore (jati-puran), reveals a split in the brahmin community in the matter of Ram’s brahma-hatya-paap. It reveals the deep caste rules in India. What is amazing in Hindu mythology is that despite granting brahmins all manner of protection, God repeatedly kills brahmins: Ram kills Ravana, Krishna oversees the killing of Drona, Shiva beheads Daksha and Brahma. This seems counter-intuitive until we appreciate the difference between the idea of ‘brahman’ in Vedas, and the brahmin caste that prevails society. 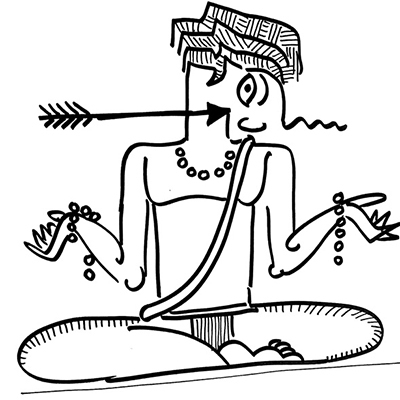 Brahmins are supposed to spread knowledge of the Vedic idea of brahman. This role grants them many privileges, including protection from harm, especially since in societies that preferred oral to written tradition, brahmins were walking libraries and killing them was equal to burning a library. Killing of brahmins by God takes place whenever the brahmin takes advantage of his birth but does not display the wisdom expected of one with the privilege of Vedic knowledge. Shiva is cleansed of brahma-hatya-paap in Kashi, which is why Kashi is such a popular pilgrim spot, but he remains a defiant god, choosing crematoriums to the sacrificial halls of brahmins. While the Vedic scriptures became more about rituals and priests, the post-Vedic Puranic and Agamic and bhakti literature, went out of their way to draw attention to the real secret of the Veda: the formless soul located within all forms, that is common to all. Yes, nature is diverse, and culture hierarchical, but we must not forget that they are myriad manifestations of the same divine seed, the ‘brahman’, also known as atma. Brahmins who neither transmit this knowledge nor display this wisdom have no claim over dharma privileges.